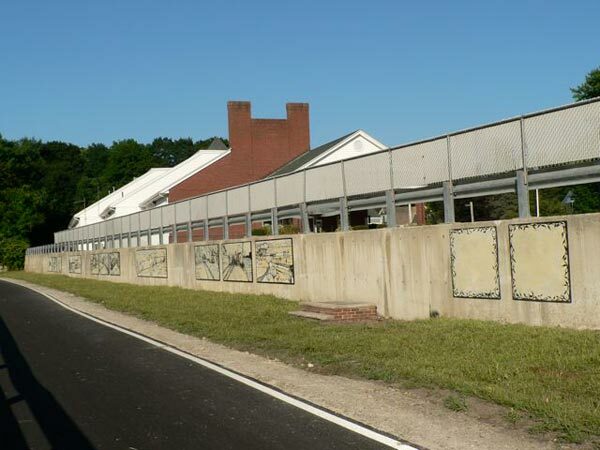 The Friends of the Bruce Freeman Rail Trail worked with local artists and carpenters to create an artwalk in Chelmsford Center. The artwalk is located along a retaining wall owned by Northern Bank and Trust Company at 14 Littleton Road, Ginger Ale Plaza. We would like to thank the Bank and the Town of Chelmsford for their support of this project. This program is supported in part by a grant from the Chelmsford Cultural Council, a local agency which is supported by the Massachusetts Cultural Council, a state agency. The artwalk was designed to serve as an outdoor art gallery. Thirteen (13) boards for murals will be interleaved with plantings. There are also boards with plaques recognizing donors or their loved ones..
Local artists Markus Lewis and Rick Lowe combined art and history as they recreated scenes from a bygone era of Chelmsford's past. The scenes were selected from photographs in the archives of the Chelmsford Historical Society; Fred Miriam is the archivist and curator. 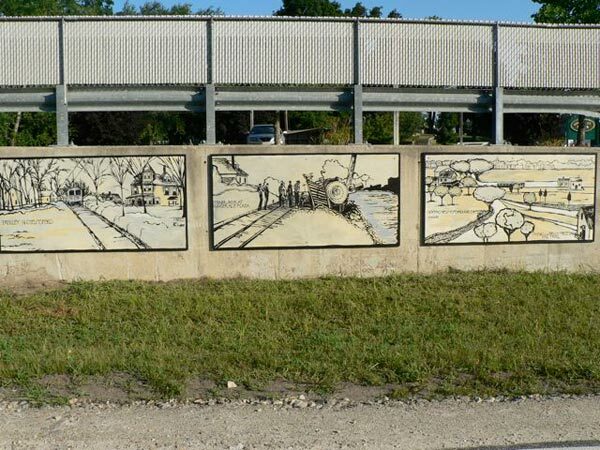 The design concept was provided by Jon Diette, a landscape architect working for Emanouil Brothers, Inc.
Help bring public art to the rail trail and celebrate a truly beautiful town. The Chelmsford Artwalk cost $6200. To date, we have $1090 in donations. That leaves $5110 that we still need to raise to cover expenses. 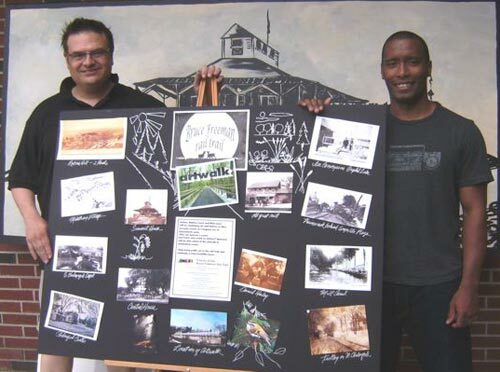 Artists Markus Lewis (left) and Rick Lowe (right) posing in front of completed Summit House mural with display of historic photos used for the Chelmsford Artwalk. The picture was taken at 4 Alpine Lane where the murals were painted. It took a village, the Friends of the Bruce Freeman Rail Trail would like to thank the many people who helped and are helping with this project. This program is supported in part by a grant from the Chelmsford Cultural Council, a local agency which is supported by the Massachusetts Cultural Council, a state agency.